I came in with severe neck pain. I felt like my right arm was going to fall off. My neck was out of alignment. I got adjusted. It was a real light touch from traditional chiropractic, where they crack your neck. Afterwards I felt a lot of tension leave, and the tension went away after two weeks. Why does my neck hurt? For those dealing with neck pain, it can be an annoying question with few real answers and a few wrong ones. And there’s one big myth out there that keeps a lot of people in pain. This is myth believed by primary care doctors, orthopedists, physical therapists, and even some chiropractors – causing them to tell you a little white lie about your neck pain. The biggest neck pain myth—I’ve got arthritis. Neck pain is my destiny. If you happen to get an MRI, or an x-ray, you may be told that you’ve got a little bit of arthritis or mild disc disease. Or a lot of both. And that the presence of these things explain your pain. The funny thing about neck pain, x-rays and arthritis, is this: your great Aunt Matilda could have ten times the amount of joint degeneration and disc disease, and not experience any of the neck pain that’s causing you to suffer. 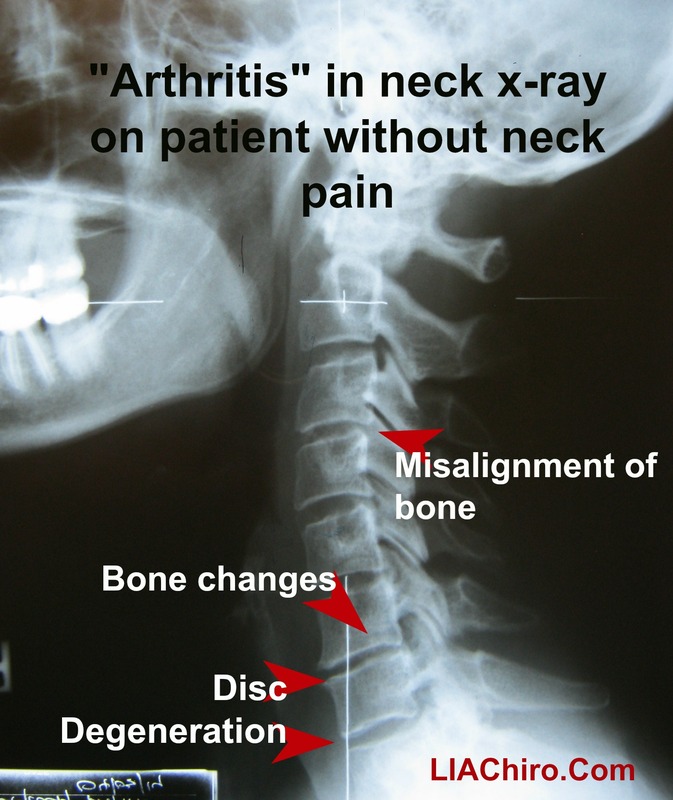 For example, in our Auburn Hills upper cervical chiropractic practice, we often order x-rays of patients with a lot of neck pain, who also happen to have a lot of arthritis. After their upper cervical correction their pain reduces and goes away, often in a few weeks. We could take another x-ray, months later, and still see that same amount of arthritis. So the arthritis wasn’t necessarily causing the pain, was it? Just because you have neck pain doesn’t mean you have arthritis. And just because you have arthritis in an x-ray doesn’t mean you’re going to have pain. 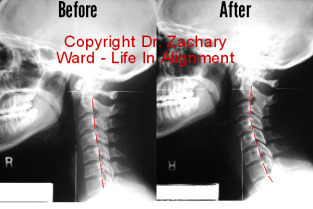 Yes, advanced joint degeneration in the neck could be a weakness that leads to pain, especially after an injury. Yes, pain can come from stressed intervertebral discs and joints. Joint degeneration is never a desirable thing. But just because a physician or chiropractor or physical therapist says there’s arthritis in your spine, doesn’t mean you’re destined for a life of neck pain. So what’s the truth? Your neck pain and your arthritis are symptoms of the same problem: poor head-to-neck neck alignment. A problem that often ends in the loss of the neck’s proper curve, and the stretching or compression of sensitive ligaments in the neck. For some people this will lead to arthritis and joint break down. For others it will lead to a painful neck. And some people will experience both, thinking one is leading to the other. But if they got a second opinion from a upper cervical chiropractor in Oakland County, they might find that their neck pain, even with arthritis, doesn’t have to be their destiny. Ready for a second opinion about your neck pain? Call the office (248) 598-4002 or email the doctor via the contact page.